A Sworn Statement of Account is an itemized list containing the names and identifying information for all the parties that have provided improvements, materials or labor and an accounting of the money that is owed to them. Under Michigan law, a contractor must provide a sworn statement to the owner or lessee in each of the following circumstances: (a) when payment is due to the contractor from the owner or lessee or when the contractor requests payment from the owner or lessee, or (b) when a demand for the sworn statement has been made by or on behalf of the owner or lessee. M.C.L. 570.1110(1). A subcontractor must provide a sworn statement to the owner or lessee upon request by or on behalf of the owner or lessee. M.C.L. 570.1110(2). Subcontractors must also provide a sworn statement to the contractor when payment is due to the subcontractor from the contractor or when the subcontractor requests payment from the contractor. M.C.L. 570.1110(3). The sworn statement must list each subcontractor and supplier with whom the person issuing the sworn statement has contracted relative to the improvement to the real property. M.C.L. 570.1110(4). It must also contain a list of laborers with whom the person issuing the sworn statement has contracted with, and for whom payment for wages or fringe benefits and withholdings are due but unpaid, along with an itemized amount of such wages or fringe benefits and withholdings. Id. The contractor or subcontractor is not required to list in the sworn statement material furnished by the contractor or subcontractor out of his or her own inventory that was not purchased specifically for performing the contract. M.C.L. 570.1110(5). Treat requests for a sworn statement seriously. If a contractor fails to provide a sworn statement to the owner or lessee before recording the contractor's claim of lien, the contractor's construction lien is not invalid. M.C.L. 570.1110(9). However, the contractor is not entitled to any payment, and a complaint, cross-claim, or counterclaim may not be filed to enforce the construction lien, until the sworn statement has been provided. Id. Along the same line, if a subcontractor fails to provide a sworn statement to the owner, the subcontractor's construction lien is valid. M.C.L. 570.1110(10). However, a complaint, cross-claim, or counterclaim may not be filed to enforce the construction lien until the sworn statement has been provided. Id. Because the statement is "sworn," there are strict penalties for falsification. A contractor or subcontractor who desires to draw money and gives or causes to be given to any owner or lessee a sworn statement that is false, with intent to defraud, is guilty of a crime. M.C.L. 570.1110(11). This article is provided for informational purposes only and should not be relied on as a substitute for the advice of an attorney. 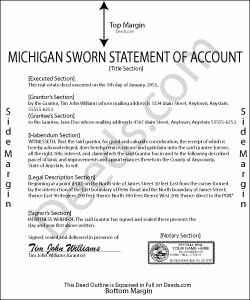 If you have any questions about using a sworn statement of account form, please consult with a licensed Michigan attorney.